In a new paper published in Nature Precedings, Andrew Adamatzky from the University of the West of England shows that slime molds like Physarum polycephalum prefers sleeping pills and their sedative effects over their standard honey and oats. P. polycephalum grows toward potential food sources and this growth pattern has been exploited by researchers to solve mazes, including once that re-created the fault-tolerant network of the Tokyo subway system in 2010. 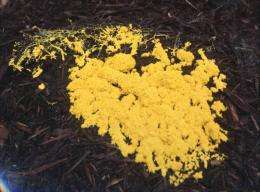 Adamatzky has been working with slime molds for some time and has used them to solve computational problems. In his most recent work, he used the slime mold to solve a geometry problem of the concave hull. These results have been published on the Arxiv repository. However, it was during this experiment that he discovered the preferred attractive source for the slime molds. Traditionally, oats and honey are used as a food source to attract the slime molds for these types of experiments. However, Adamatzky was finding that these sources were not working well enough and wanted to discover a more effective long-distant attractant. What he discovered was that the slime molds were most attracted to an over the counter herbal sleeping tablet that he had found. Wanting to know exactly what was attracting the slime mold to the tablets, Adamatzky tested each of the active ingredients within the tablet. He discovered that the P. polycephalum was most attracted to the valerian root, or Valeriana officinalis, within the tablet. He believes that this discovery will work to attract the slime molds as well as keep them concentrated in a local area. It is his hope that this discovery will allow for more advanced procedures using slime molds. A plasmodium of acellular slime mould Physarum polycephalum is a large single cell with many nuclei. Presented to a configuration of attracting and repelling stimuli a plasmodium optimizes its growth pattern and spans the attractants, while avoiding repellents, with efficient network of protoplasmic tubes. Such behaviour is interpreted as computation and the plasmodium as an amorphous growing biological computer. Till recently laboratory prototypes of slime mould computing devices (Physarum machines) employed rolled oats and oat powder to represent input data. We explore alternative sources of chemo-attractants, which do not require a sophisticated laboratory synthesis. We show that plasmodium of P. polycephalum prefers sedative herbal tablets and dried plants to oat flakes and honey. In laboratory experiments we develop a hierarchy of slime-moulds chemo-tactic preferences. We show that Valerian root (Valeriana officinalis) is the strongest chemo-attractant of P. polycephalum outperforming not only most common plants with sedative activities but also some herbal tablets. Wastewater: Energy of the future? The slime molds you'll find hanging around my neighborhood prefer Oxycontin.